We asked Dr. Jean Mulcahy Levy, a St. Baldrick’s Scholar, about astrocytoma, a type of childhood cancer. Read her explanation of astrocytoma symptoms, treatment options, and research opportunities. Astrocytoma is a type of tumor that can happen in the brain or spinal cord. They are one of the most common brain tumors seen in children, with approximately 700 children diagnosed with low-grade astrocytoma — a slow-growing tumor — each year. 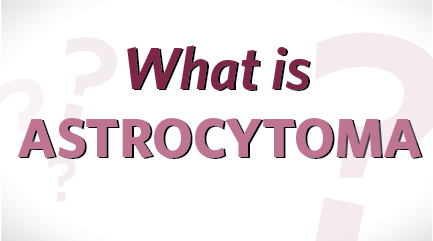 What are the signs and symptoms of astrocytoma? The type of symptoms will depend on where it is growing, how big it is, and how fast it grows. General symptoms can include morning headaches, vomiting, trouble walking or balancing, or weakness in one side or part of the body. Some children may have more serious symptoms like seizures, vision or hearing loss, or changes in personality or behavior. Babies may have an increasing head size without many other symptoms. What treatment options are available for astrocytoma? Treatment is designed to fit each patient’s special needs depending on their age, location of tumor, and the tumor’s histological grade and genetic features. Surgery: The primary goal for all astrocytoma patients is to remove the tumor completely with surgery if possible. This is particularly important in low-grade brain tumors because if you can remove the entire tumor, no other treatment may be needed. Chemotherapy: If all of the tumor cannot be removed with surgery, chemotherapy may be used. Commonly used drugs to kill these tumor cells are carboplatin and vincristine (or vinblastine). Radiation: A small number of patients may benefit from radiation therapy. This includes older patients or patients whose tumors grow back despite treatment with surgery and chemotherapy. What is the current state of astrocytoma research? Research in the treatment of low-grade astrocytoma focuses on developing new treatments that decrease tumor growth without increasing side effects. Patients with tumors that grow back despite current therapy are in particular need of new therapies because they are known to have poor long-term outcomes. Together we can take childhood back from cancer. Fund lifesaving research today.